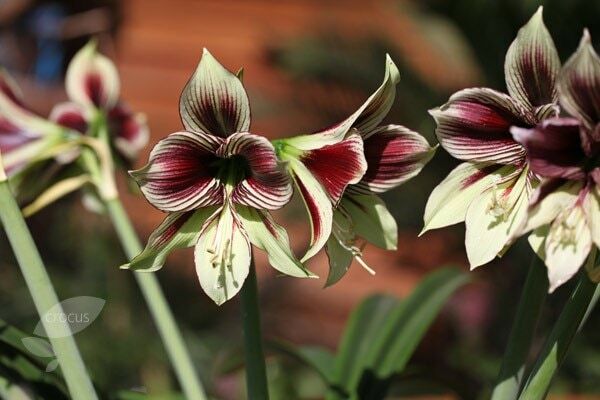 Unlike ordinary amaryllis, 'Papillo' has several flower stems which are shorter than most amaryllis and these are covered in elegant red and white trumpets. It flowers 6 weeks after planting and looks wonderful planted in a pot. It will also come back year after year - fabulous! Once flowering has finished cut off the flower stalk 5-10cm above the bulb - don't cut off the foliage. Water when the surface of the compost is dry and feed regularly with a balanced liquid fertiliser. Usually the best thing to do is keep watering it through the summer and in autumn stop watering and move to a dark, dim spot. This simulates the drought season of the plant’s native South America. Allow it to dry out for a few months so that the foliage wilts and dies back. In November bring it back in to the light and start watering again. Old foliage should be removed though take care not to cut any new shoots off. In a few weeks a new flower shoot will appear and flower just in time for Christmas. Hello, You should be able to fit three of these bulbs into one 20-25cm diameter pot. As for the material, I would opt for terracotta as it is heavier and less likely to topple over. Is this plant suitable for growing indoors in a pot ready for Christmas flowering?